Nelson Labs offers a comprehensive set of tests for surgical gown and drape barrier performance and biocompatibility. These tests are essential to ensuring performance properties are validated to support marketing label claims and to classify surgical drapes and gowns. The number of test sites and product classification (AAMI PB70 or EN 13795) determine the type of test to be performed. For the Viral Penetration test, compatibility assessment should occur for each material and for each site, if different. Manufacturers should also consider the microbial cleanliness of the gown following EN ISO 11737-1 using the bioburden test method. Particle shedding properties and biocompatibility should also be assessed depending on the material type and intended use. This test uses an electrically driven turntable to rotate an agar plate while a vertical finger presses on a material inoculated with bacteria. The inoculated material, called the donor, lies on top of the test article. The finger is moved over the entire surface of the plate at a rate of 60 revolutions per minute for 15 minutes. The finger exerts a 3 Newton force on the agar plate. Due to the effect of rubbing and liquid migration, bacteria can pass from the donor through the test specimen down to the agar plate. The results characterize the barrier capability and the penetration over time. Dry microbial penetration determines the ability of contaminated particles to migrate through materials. Test specimens are fixed in a container and talc contaminated with ≥108 colony forming units per gram (CFU/g) of B. atrophaeus is poured onto the test specimen. A sedimentation plate is inserted at the base of each container at a short distance below the test specimen. The apparatus supporting the containers is vibrated at approximately 20,800 rpm for 30 minutes. The talc that penetrates the test material is captured on the sedimentation plate which is removed after testing and incubated. Specimens are conditioned for wet and/or dry testing, and clamped in the burst tester using a clamp with an area of 10 cm2. The pressure is increased at a constant rate of 100 mL/min until the sample bursts. The pressure at burst, time to burst, and height at burst are recorded. Samples are subjected to a combined twisting and compression action in a test chamber using a Gelbo Flex mechanism. 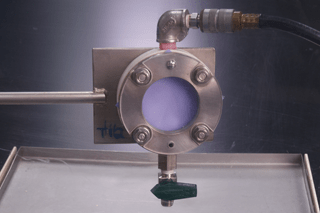 During the flexing, air is withdrawn from the chamber and the particulates generated are enumerated and sized using a laser particle counter. This procedure is performed to quantify the particles dislodged from a sample through the application of mechanical energy under dry conditions to simulate the particle shedding from the surface of the sample. The average particle concentration is determined and used to calculate a particle emission rate that can be compared to the test article cleanliness classification listed in IEST-RP-CC003.4. If you have additional questions about Surgical Gowns and Drapes testing, or would like to consult with the experts at Nelson Labs, just send us a request or call us at +1 (801) 290-7500.